Left to right: Officer Thomas Hickman, Lt. Leo Girard, Sgt. Robert Kelch, Chief Everette Robbins, Deputy Chief Mark Perkins, Sgt. Bryan Tyitye, Officer Joshua Green, Dispatcher Meredith Foster. Photo courtesy of the Huron Township Police Department. 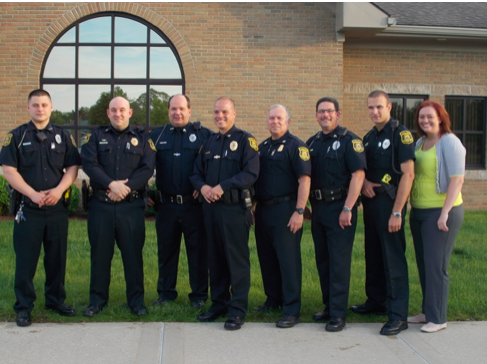 Police Chief Everette Robbins made multiple promotions within the Huron Township Police Department during the May 27 Board of Trustees Meeting. The promotions came in the forms of two new sergeants, three new road patrol officers, a full time dispatcher and a new liaison to the Summit Academy Schools. Corporals Bryan Tyitye and Robert Kelch were promoted to the rank of Sergeant, part time Officers Kenneth Hickman, Joshua Green and James Poma were promoted to full time road patrol positions, Dispatcher Meredith Foster was given a full time position in the dispatch center, and Corporal Keith Nickrand will be transitioning to the Summit Academy schools in the fall as the liaison officer. Tyitye, a veteran officer who has worked with the department since 1995, began his career in law enforcement as a reserve officer with the Monroe City Police Department. Tyitye has been working in the Summit Academy schools as a liaison officer for the past 11 years. Tyitye has worked in Western Wayne Auto Theft, was a recipient of HEAT officer of the yeas in 2004 and is a current supervisor of the Huron Township Police Explorers program. Tyitye thanked his wife and four daughters for their love and support. Kelch began his public service career as a United States Marine. He holds an associates degree from St. Clair Community College and has been employed with the Huron Department for over 18 years. Kelch is an evidence tech and member of the Michigan State Police Auto Theft Team. Kelch thanks his wife of 29 years, two sons and granddaughter for their support. “Sgt. Tyitye and Sgt. Kelch each have the leadership ability that our department needs. Their professionalism, dedication, and experience will be essential to our departments success moving forward,” said Robbins. Officer Hickman has been with the department for over a year. He holds a bachelor’s degree from the Schoolcraft Police Academy and resides proudly in Huron Township with his family. Hickman thanks his family for the support they have given him during his tenure as a part time officer. He expressed to the board what it honor it is to be part of this community. Officer Green started his time in Huron as an Explorer when he was 14 years old. Green has been employed as a part time officer during the past six months after graduating from the Schoolcraft College Police Academy with an associate’s degree. He thanks his parents for their support and is very proud to be following in his father’s footsteps. Green also thanked Officer Fred Yono for his mentorship during his employment with the department. “Each of these officers has proved themselves in a part time capacity and we are proud to have them as a permanent part of our team. Each of them could have taken opportunities at other departments, but chose to stay in our community. That is the type of commitment that will make us the department we strive to be,” said Robbins. Dispatcher Meredith Foster has been a part time employee for the past two years and is also a reserve officer with the department. She thanks her family for helping her with the education and motivation to reach this goal, as well as the Huron Township Board for the opportunity to serve the community. “Dispatcher Foster has been a great asset to our department for 2 years. She has waited patiently for this opportunity and we are very happy to reward her hard work,” said Robbins. Corporal Keith Nickrand, who will take over liaison duties at Summit Academy, is currently working as a mentor in the Police Explorers program. “Corporal Nickrand is the true definition of what a school liaison is and should be. He will have a tough act to follow in Bryan Tyitye who did an outstanding job at Summit for the past 11 years. Corporal Nickrand made an impact on many young people’s lives in the Huron School District over the past 20 years,” said Robbins. This entry was posted in Front Page News, Government, Police & Fire on May 29, 2015 by Scott Bolthouse. Once again i do not see any recognition of Lt. Dockter. Come to the board meeting. All other volunteered. This article is about those that got promoted.